PASCAGOULA, Miss. (May 2, 2015) – Huntington Ingalls Industries’ (NYSE:HII) Ingalls Shipbuilding division christened the company’s 29th Arleigh Burke-class (DDG 51) Aegis guided missile destroyer, John Finn (DDG 113), today in front of nearly 1,000 guests. Laura Stavridis, wife of Adm. James Stavridis (U.S. Navy, Ret.) and DDG 113 ship sponsor, smashed a bottle of sparkling wine across the bow of the ship, officially christening DDG 113 as John Finn. “God bless this ship and all who sail on her,” she said. Ingalls has delivered 28 Arleigh Burke-class destroyers to the U.S. Navy. Destroyers currently under construction at Ingalls are John Finn (DDG 113), Ralph Johnson (DDG 114), Paul Ignatius (DDG 117) and Delbert D. Black (DDG 119). Earlier this year, Ingalls received a contract modification funding the construction of the company’s 33nd destroyer, DDG 121. 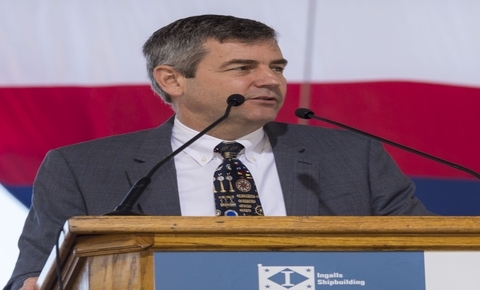 “Rest assured these shipbuilders—Ingalls shipbuilders—understand their noble calling,” said Ingalls Shipbuilding President Brian Cuccias. 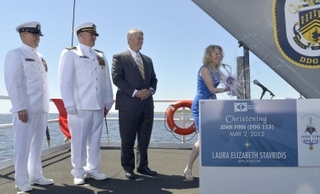 “To build ships like John Finn safe, strong and proud for the sailors and Marines who sail in her, with strength pride and our deepest gratitude and respect.